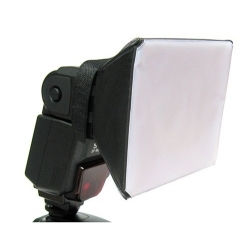 This SoftBox / Diffuser can enlarges and diffuses the light with the flash in the direct flash position. To soften shadows and eliminate unpleasant red eye!! Meanwhile, it does not block either exposure sensors or auto focus assist beams on most flashes. Recommend for product and portrait photography. Effective Foldable, easy to carry outdoor. ⑴ to wear tight and with a hole in the diffuser on each. ⑵ to slip the trap on the flash. ⑶ Finally, the diffuser installed on the flash, and the cable tight with tension. 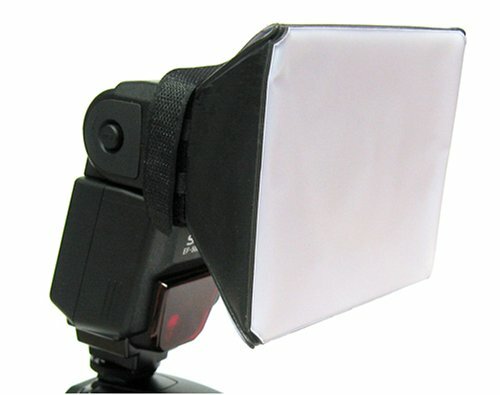 This applies not only to soft mask is more to do close-up portraits lighting, ultra wide-anglephotography aids. Use of strong elastic band, no magic stick, open label type, TTL, AUTO are applicable. Soft material, can be crushed into the collapsible, easy to carry. Outer black inner reflective silver mask, to avoid unnecessary energy waste.